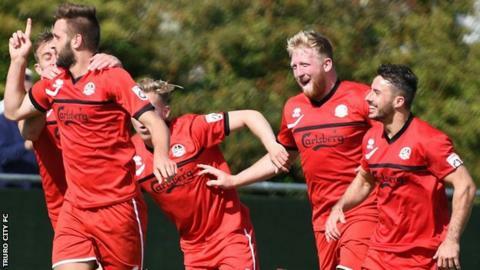 Truro City boss Steve Tully says his tactical moves "came off" as they recovered from a goal down to claim their first National League South win of the season against Concord Rangers. The White Tigers trailed at half-time to an early effort from Tony Stokes, who was sent off in the closing stages. However, Shane White's penalty and Matt Wright's header completed the comeback. "It's always nice when tactical decisions come off and it definitely happened for us today," said Tully. "In the second half I thought Aaron Dawson in the holding role, with Jake Ash pushed further on, was a real presence. "There were a few home truths said at half-time, but it's three points in the bag and we'll take four points out of nine for the start." Truro are back in the second tier of non-league football after two seasons in the Southern Premier League. The Cornish side go to Sutton United on Monday night, who have the same record from their opening three games. "I think there'll be a little bit of change because it's a quick turnover for the players," Tully told BBC Radio Cornwall. "There are people like Aaron Pugh and Ryan Brett who've trained really well and deserve a chance in the team."